abnormally rapid heart rate, usually taken to be over 100 beats per minute. adj., adj tachycar´diac. A, Sinus tachycardia; B, Ventricular tachycardia. From Chernecky, 2001.
antidromic circus movement tachycardia a supraventricular tachycardia supported by a reentry circuit that uses the atrioventricular node in the retrograde direction and an accessory pathway in the anterograde direction; this produces a broad QRS rhythm indistinguishable from ventricular tachycardia. Such a tachycardia may also use two accessory pathways (one anterograde and one retrograde) and not involve the AV node at all. atrial tachycardia a rapid heart rate, between 140 and 250 beats per minute, with the ectopic focus in the atria and with no participation by the atrioventricular node or the sinoatrial node. It is recognizable on the electrocardiogram because the P wave precedes the QRS complex, as opposed to being merged with it or following it. This condition is usually associated with atrioventricular block or digitalis toxicity. benign ventricular tachycardia tachycardia originating in the ventricles, not associated with structural heart disease or significant hemodynamic symptoms. bidirectional ventricular tachycardia (bifascicular ventricular tachycardia) a ventricular arrhythmia characterized by heart rates of 90 to 160 beats per minute, alternating right and left axis deviation, ectopic focus that alternates between the anterior superior and posterior inferior fascicles, and a right bundle branch block pattern in lead V1; seen in digitalis toxicity and other conditions. chaotic atrial tachycardia an ectopic atrial tachycardia due to multifocal activity, characterized by at least three different shapes of P waves on the electrocardiogram; often associated with chronic obstructive lung disease. circus movement tachycardia (CMT) a reentry circuit that uses an accessory pathway or pathways; there are two subtypes, antidromic and orthodromic circus movement tachycardia. ectopic tachycardia rapid heart action in response to impulses arising outside the sinoatrial node. junctional tachycardia rhythm at the rate of 100 to 140 beats per minute that arises in response to impulses originating in the atrioventricular junction, i.e., the atrioventricular node. It is often seen with digitalis toxicity and is due to triggered activity, but it may also be due to altered automaticity. In the case of digitalis toxicity, the term may be used to encompass the entire span of junctional rates with this condition, i.e., approximately 70 to 140 beats per minute. monomorphic ventricular tachycardia a type that has a uniform beat-to-beat QRS morphology. nonsustained ventricular tachycardia a type that terminates spontaneously within 30 seconds and does not lead to hemodynamic collapse. orthodromic circus movement tachycardia a supraventricular tachycardia supported by a reentry circuit that uses the atrioventricular node in the anterograde direction and an accessory pathway in the retrograde direction, producing a narrow QRS complex. orthostatic tachycardia disproportionate rapidity of the heart rate on arising from a reclining to a standing position. paroxysmal tachycardia rapid heart action that starts and stops abruptly. paroxysmal atrial tachycardia paroxysmal supraventricular tachycardia. paroxysmal supraventricular tachycardia (PSVT) a narrow QRS tachycardia that begins and ends abruptly; it may be terminated with a vagal maneuver. It has two common mechanisms, atrioventricular nodal reentry and circus movement that uses the atrioventricular node anterogradely and an accessory pathway retrogradely. On the electrocardiogram it is characterized by abrupt onset, and mechanisms are differentiated by the relation of the P wave to the QRS complex. polymorphic ventricular tachycardia a type that has a constantly, and sometimes subtly, changing beat-to-beat QRS configuration. potentially malignant ventricular tachycardia a type that is not associated with structural heart disease or hemodynamically important cardiac symptoms but is sometimes associated with left ventricular dysfunction. sinus tachycardia (ST) a rapid rhythm originating in the sinoatrial node with a rate of usually 100 to 160 beats per minute; conduction through the ventricles is normal. During exercise or stress this is normal, but if it occurs during rest it is abnormal. supraventricular tachycardia a combination of junctional tachycardia and atrial tachycardia. sustained ventricular tachycardia tachycardia that lasts more than 30 seconds and leads to hemodynamic collapse. ventricular tachycardia an abnormally rapid ventricular rhythm with aberrant ventricular excitation, characterized by at least three consecutive ventricular complexes of more than 100 beats per minute. It is generated within the ventricle and is most often associated with atrioventricular dissociation. Rapid beating of the heart, conventionally applied to rates over 90 beats per minute. atrial tachycardia a rapid cardiac rate, usually 160–190 per minute, originating from an atrial locus. atrioventricular (AV) junctional tachycardia , atrioventricular (AV) nodal tachycardia junctional t.
atrioventricular nodal reentrant tachycardia that resulting from reentry in or around the atrioventricular node; it may be antidromic, in which conduction is anterograde over the accessory pathway and retrograde over the normal conduction pathway or orthodromic, in which conduction is anterograde over the normal conduction pathway and retrograde over the accessory pathway. atrioventricular reciprocating tachycardia (AVRT) a reentrant tachycardia in which the reentrant circuit contains both the normal conduction pathway and an accessory pathway as integral parts. chaotic atrial tachycardia that characterized by atrial rates of 100 to 130 beats per minute, markedly variable P wave morphology, and irregular P–P intervals, often leading to atrial fibrillation. circus movement tachycardia reentrant t.
junctional tachycardia that arising in response to impulses originating in the atrioventricular junction, i.e., in the atrioventricular node, with a heart rate greater than 75 beats per minute. multifocal atrial tachycardia (MAT) chaotic atrial t.
nonparoxysmal junctional tachycardia a junctional tachycardia of slow onset, with a heart rate of 70 to 130 beats per minute; due to enhanced automaticity of the atrioventricular junctional tissue, often secondary to disease or trauma. paroxysmal supraventricular tachycardia (PSVT) supraventricular tachycardia occurring in attacks of rapid onset and cessation, usually due to a reentrant circuit. reciprocating tachycardia a tachycardia due to a reentrant mechanism and characterized by a reciprocating rhythm. reentrant tachycardia any tachycardia characterized by a reentrant circuit. sinus tachycardia (ST) tachycardia originating in the sinus node; normal during exercise or anxiety but also associated with shock, hypotension, hypoxia, congestive heart failure, fever, and various high output states. supraventricular tachycardia (SVT) any regular tachycardia in which the point of stimulation is above the bundle branches; it may also include those arising from large reentrant circuits that encompass both atrial and ventricular sites. ventricular tachycardia an abnormally rapid ventricular rhythm with aberrant ventricular excitation, usually above 150 beats per minute, generated within the ventricle, and most often associated with atrioventricular dissociation. A rapid heart rate, especially one above 100 beats per minute in an adult. tach′y·car′di·ac (-dē-ăk) adj. & n.
a condition in which the heart contracts at a rate greater than 100 beats/min. It may occur normally in response to fever, exercise, or nervous excitement. Pathological tachycardia accompanies anoxia, such as that caused by anemia; congestive heart failure; hemorrhage; or shock. Tachycardia acts to increase the amount of oxygen delivered to the cells of the body by increasing the rate at which blood circulates through the vessels. tachycardiac, adj. Cardiology A rapid heart rate, usually defined as a rate over 100 beats/min. See Atrioventricular nodal reentrant tachycardia, Multifocal atrial tachycardia, Narrow QRS complex tachycardia, Pacemaker-mediated tachycardia, Supraventricular tachycardia. Cf Bradycardia. Rapid beating of the heart, conventionally applied to rates over 100 beats per minute. A rapid heart rate from any cause. an increase in heart rate above the normal rate. A fast heart rate. Tachycardia is one of the two types of arrhythmia. n rapid heart beat of more than 100 beats per minute in an adult. It occurs normally in response to fever, exercise, or excitement. It may also accompany anoxia caused by heart failure, shock, hemorrhage, or from certain arrhythmias. Rapid beating of heart, conventionally applied to rates over 90 beats per minute. n an excessively rapid action of the heart; the pulse rate is usually above 100 beats/min. rapid contraction of the atrium arising from an ectopic focus in the atrium. The heart rate remains normal. rapid heart action in response to impulses arising outside the sinoatrial node. one occurring as a compensation for a sinus bradycardia and A-V block. that arising in response to impulses originating in the atrioventricular junction, i.e. the atrioventricular node. disproportionate rapidity of the heart rate on arising from a recumbent to a standing position. 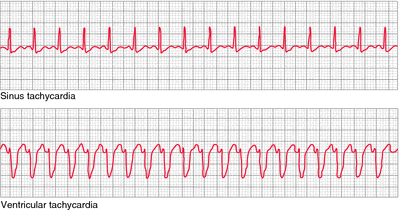 episodes of an abrupt and marked increase in heart rate in a resting patient, with an equally sudden return to normal. an increase in heart rate from heightened activity of the sinoatrial node, such as occurs with excitement or pain. a combination of junctional tachycardia and atrial tachycardia.